These Chocolate Panna Cottas are made with Greek yogurt for thickness, tang, protein, and deliciousness. Since there are so few ingredients in this dessert, quality matters. Seeking out a local regional dairy that sells organic milk and dairy products is well worth the effort. I like to use (local to me) Strauss Greek yogurt for the intense tang it brings to this dish, but that may be too much tartness for some. Whatever yogurt you use, know that these panna cottas are lovely with fresh local berries. You may also want to check out these Buttermilk Panna Cotta for an equally tasty twist on the classic "cooked cream" dessert. These are extra tasty when served with seasonal fruit on the side. Berries, in particular, are a good match. I've also been known to gild the lily and add a dollop of whipped cream. Put the gelatin and 1/2 cup of the milk in a small bowl. Stir until the gelatin is dissolved. Set it aside. In a small saucepan, whisk together the remaining 1 1/2 cups milk, sugar, and cocoa. Put over medium-low heat and cook, stirring now and again, until steaming. Add the chopped chocolate, take off the heat, and stir until the chocolate dissolves. Whisk the gelatin mixture into the cocoa mixture. In a large bowl, combine the yogurt and vanilla. Slowly whisk in the cocoa mixture. Decrease the setting time by placing the bowl in an ice bath (a larger bowl filled with ice) and stir the mixture until it cools down. This step is optional, but it will significantly decrease the time it takes the panna cotta to set. Without cooling it over an ice bath, it will take an overnight spell in the fridge to set, which, if you've planned ahead is no problem. If, however, dinnertime is coming a bit sooner than that, cooling the mixture down before putting it in the fridge to set means you can tuck into dessert in a few hours. 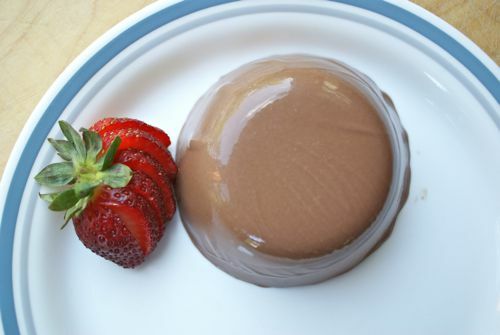 Whether you've cooled it over an ice bath or not, pour the panna cotta mixture into 6 or 8 small ramekins. Cover the ramekins and chill them until the panna cotta is set (it will still jiggle when you shake the ramekins, but only very little), sometime between 2 hours and overnight, depending on if you chilled it down first.